Restricted parking. Details: segreenberg reports: Note that the chargers are behind locked gates when the business is closed. "Spring" hours listed on the web site are M-S 7:30am to 6pm, Sunday 8am to 5pm, closed holidays. Check at 707-823-9125 or harmonyfarm.com to make sure they're open. 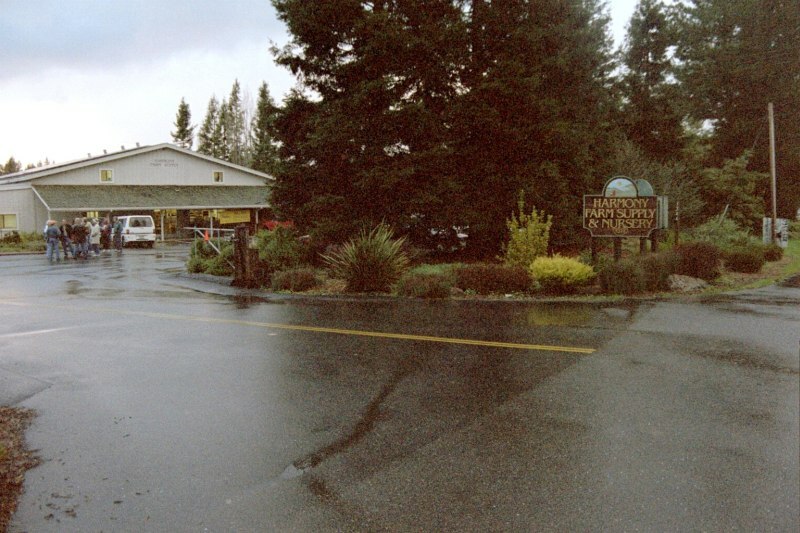 Harmony Farm Supply is located on the West side of I-116 (Gravenstein Highway), just North of the intersection of Graton Road and Frei Road, about 4 miles North of Sebastopol downtown. From 101, take Guerneville Road heading West, until reaching the T-junction at I-116. Turn left and Harmony farm is less than a mile on the right hand side. See www.harmonyfarm.com/HFSmap.jpg for further directions. Chuck Hursch, 5/05: The first photo is looking north along the west side of Hi-116 showing the Harmony sign, while the left side of the image peers west into the Harmony lot. I took this picture so as to give EV drivers looking for this site a heads up as to what the entrance looks like as they are driving by at 45mph. It appears that the Harmony sign also has one aimed at southbound drivers, like for our driving instructions on the webpage. It usually takes me a couple of passes down the road to find this place, since I'm not there that often, and I don't remember well what the entrance looks like. 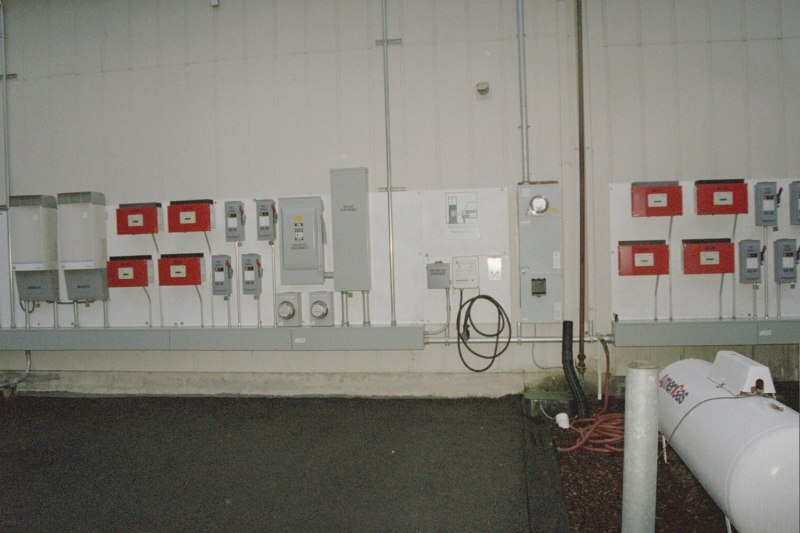 The second picture shows the EV charging station along with all the inverters, etc. of this fabulous grid-tied solar setup (if you're interested, this link should get you a few details). The charging station is on the north (right side) side of the building seen in the first photo. Photo by Chuck Hursch, 1/05 -- see charging station location comments above. Generated on Sunday, 1/30/2011, at 10:45:49 PM PT from evcnall.fp7. 9/28/10: Added restricted hours note. 7/29/05: Added photos, and charger location comments. 8/27/03: corrected spelling from Sebastapol to Sebastopol.